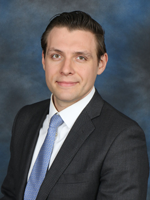 Bogdan Kachur is an associate in the firm’s Litigation Department practicing in New York and New Jersey. He joined the firm in 2018, and focuses his practice on complex commercial matters as well as cases involving commercial real estate, employment issues, trust and estates, corporate dissolution, intellectual property and disputes regarding interpretation and implantations of contractual provisions. Prior to joining Winne Banta, Bogdan was an associate with another prominent New Jersey law firm where he practiced in general and commercial litigation. Bogdan also served as a judicial law clerk to the Honorable Katherine R. Dupuis P.J.Ch. and the Honorable Joseph P. Perfilio J.S.C. in the Superior Court of New Jersey, Chancery Division of Union County. There he conducted extensive research and drafted opinions for cases concerning a wide range of commercial and corporate matters as well as opinions involving equitable relief. Previously, he served as a legal intern in the U.S. Attorney’s Office for the Eastern District of Philadelphia and the Delaware Attorney General’s office, Criminal Division, where he gained experience in complex criminal issues including judicial fraud, insider trading and tax evasion. Bogdan later applied this knowledge to the Civil Consumer Protection and Fraud Division of the Delaware Attorney General’s office where he worked as a law clerk, assisting the Deputy Attorney General in fraud trial preparation, including discovery and suppression issues. Bogdan is fluent in Ukrainian and Russian.